What REALLY stops most people from making the money they want has nothing to do with a lack of experience or expertise. That keeps them stuck where they are. In a job they find unfulfilling. Where, week in and week out, they trade their precious time and energy for a paycheck that'll never be enough to truly fund their passions and dreams. And mistakenly believing that there's nothing they can do to change it. It loses its power and frees them up to finally create the income and quality of life they desire and deserve. 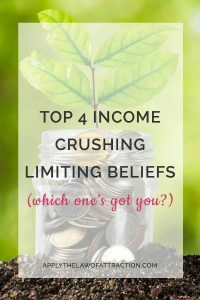 So, what are these 4 income-crushing lies? And, most importantly, which one have YOU been telling yourself (without even realizing it!) that's been blocking you from making the money you want? I hope you find the free customized video report you’ll receive at the end as insightful as I did mine! My question is,how often we should have visualization?Until manifesting our desire?